CRY, Child Rights & You America Inc, a non-profit that works towards ensuring underprivileged children their basic rights, hosted their annual CRY Gala Dinner in New York on Friday June 9, 2017 at The Taj Pierre Hotel. 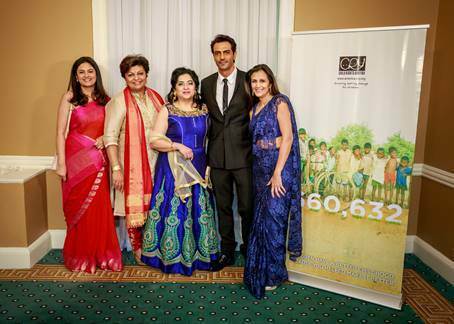 Celebrity guest Arjun Rampal joined CRY America to amplify the voices of underprivileged children & support the cause. Rampal with Major Gift Donors Sandeep & Nilima Jain and their daughters Kavita and Aanchal. The evening was attended by over 140 guests from the NY-NJ area and raised $120,000 for children’s rights. Besides raising awareness for the cause, it was an enjoyable evening with dinner, cocktails, auction, entertainment, music and dancing. 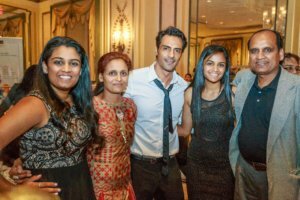 Arjun Rampal mesmerized the guests with his charming personality & his fundraising appeals increased the collection for the evening. The guests were privy to the trailer of “Daddy” produced by Rampal and scheduled for release on July 21st. The live skype call was a special point in the evening where the guests interacted with Dr. Rolee Singh from CRY supported Project SSRF in Varanasi & 14 year old Akeela shared her story of how she was saved from child marriage & went back to school to pursue her dreams. The auction featured paintings donated by noted Indian artists Ram Kumar, JMS Mani, Vasudev, Vaikuntam, Solanki & Anuradha Thakur; fashion ensembles donated by JJ Vallaya, Abu Jani-Sandeep Khosla, Neeta Lulla, Ritu Kumar; an evening clutch by Sabyasachi; jewelry pieces donated by Raj Jewels, Aquamarine, Surat Diamonds & ReeMat Collections; record albums autographed by Prince and the Rolling Stones and a Beatles concert poster autographed by Paul McCartney & Ringo Starr. CRY America thanks all the donors for making the CRY Gala a success, with special mention to Ajay & Anita Agarwal, Rupal & Harsh Patil, Roopam & Sanjeev Jain, Meenakshi & Vikas Mahajan, Sandeep & Nilima Jain, Anupam Yadav, Kamini & Vijay Dandapani, Dr. Hetal Gor, Gopal Kutty, Roger & Jayshree Sawhney, Shefali & Sumer Salwan, Supriya & Prafulla Nabar, Janill & Sahul Sharma, Arati & Srikant Nagaraj, Kamal & Kiran Arora. CRY America also thanks the media for their support, especially Star TV, TV Asia, India Abroad & Parikh Worldwide. CRY America works with grass-root Projects, communities and local government agencies to ensure children have quality education, health care and are protected from child labor, child marriage & gender discrimination. CRY’s child rights model has stood the test of time and delivers impact that brings lasting change in the lives of the communities & children it serves. CRY is well known for its professional project planning, monitoring & selection processes in the field.